I was so grateful when one of my in-laws going to Israel and apart from that I can send my prayers (Written In a Notes) with them to be inserted at the western wall of Jerusalem. What I believe was different from other people but what we believe in religion was same with other people. My notes of Prayers will be inserted between the gap of the western wall of Jerusalem. I hope that my prayers will be answered soon. Although I can pray from my own but doing prayer in the Holy City was very astonish to me. Hope that my in-laws will help me, my wife and mother in-laws written notes of prayers to insert it at the Western wall Of Jerusalem. My in-laws or my wife cousin going there with a group of people, all Sabahan and lead by a Bishop. The cost of going there roughly take RM11k and most of all the safety of the pilgrims. According from my reading, Jerusalem was a Holy City for the Christians, Jewish and Muslim. 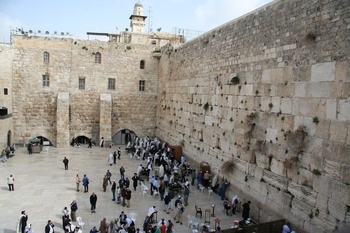 The Western Wall was the remaining of the Jewish Temple. The Jewish Temple was surrounded by big wall in ancient time and anyone of you, who have visited Jerusalem.. you know it. As it for me, I'm dreaming to go there but because of my work, my budget prevent me to do the pilgrims. With this opportunity I have sealed my written notes to carry forward by my in-laws to be inserted at the gap of the Jerusalem Old City Western Wall. I have prayed for my Family, Relative, My hometown of Tamparuli, Sabah and Malaysia. I hope that all the Malaysian can live in Harmony and peace forever. Thanks GOD for giving me such a wonderful opportunity. The Old City of Jerusalem is hard to ignore! It might not be big (it’s only 1 square kilometer in size), but within those walls are some of the most important religious sites in the world, some of the most intense history and politics, some of the most beautiful coexistence, and almost undoubtedly, some of the greatest surprises. 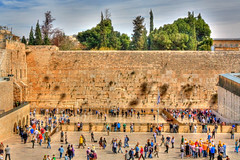 Depending on religious background, you will experience the Old City in very different ways – for Jews, the Kotel or Western Wall, is the holiest place in the world as the last remaining wall of the Temple, for Christians, there is the Church of the Holy Sephulchre, believed to be the place where Jesus is buried, and for Muslims, there is the Al-Aqsa Mosque. As well as the core religious sites, the Old City is full of fascinating markets, alleyways, and museums, fascinating people to watch, and, amazing surprises.